Earlier this week, the trailer for Star Wars: The Last Jedi premiered. 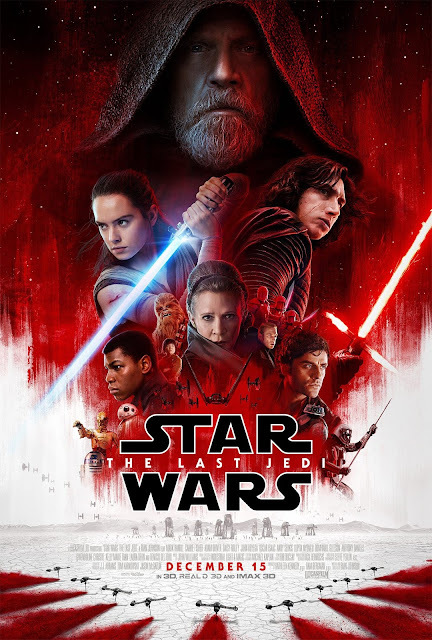 After we recovered from the initial shock of the trailer, a few of us came together to share our reaction and our thoughts for the upcoming film in the Star Wars saga. “When I found you, I saw raw, untamed power. And beyond that, something truly special.” Although the trailer tries to make us think he’s addressing Kylo, Snoke is obviously talking to Rey here. Since Rey is the character on the “good side” being tempted by the darkness, it makes more sense that Snoke is motivating her to give in to that temptation. “When I found you” is further proof. According to the canon novels, Snoke has been manipulating Kylo since he was in the womb, whereas he found* Rey after she was born. It kind of looks like Luke, afraid of her powers, is going to push Rey away rather quickly. I hope they don’t have his personality stray too far away from the Luke we got to know in the original trilogy since that Luke wasn’t the kind of guy who would just give up on people like that. “Let the past die. Kill it if you have to. That’s the only way to become what you were meant to be.” The trailer wants us to think Kylo is talking to himself here, but again, I think he’s talking to Rey. Probably after they team up. The scene where Kylo hovers his finger over the trigger to kill his mother (who he still loves) and Leia is watching and wondering if she’s about to die by the hand of the son she still loves = chills. These kinds of scenes are made for people like me. I’m also fairly confident he’s not going to go through with it, despite the fact that this is Carrie Fisher’s last film. That shot of Captain Phasma standing in front of an explosion is even more epic than Tony Stark’s famous shot. What good deed did we do to deserve it? Is it just me or does it genuinely sound like Snoke is saying “Fore-fill your destiny” rather than "fulfill"? We see a shot of Rey being tortured by Snoke. Probably from the same scene Snoke gives her the “when I found you” speech. This whole sequence will most likely be a callback to the Palpatine/Luke scene in Episode VI. Kylo will bring Rey to Snoke, thinking he’ll convert her to their side. Snoke will try to turn her dark, but it won’t work and will lead to her torture instead. Seeing Rey being tortured will probably make Kylo snap, just as Vader did, and the film will end with him betraying Snoke and leaving with Rey. Then the homage to the original trilogy will be complete, and Episode IX can take us in a brand new direction. “I need someone to show me my place in all this.” *shows Kylo holding out his hand* Now, as much as my little shipper heart loves this, I think these are actually two different scenes. Rey is wearing the outfit she has on at the beginning of the film, not the one she puts on later. Which means she’s probably talking to Luke. The shot of Kylo is probably from the end of the film. It is still a very telling shot, though, as the most likely people to whom he would be holding out his hand would be either Rey or Leia. It’s probably a post-redemption shot. (I used to believe Kylo’s redemption arc would extend over all three films, but now I think his redemption will take place in this one and he'll be Ben Solo during Episode IX.) The goal of putting these two shots together is to make us think Rey is going full-on dark side. But, as cool as that would be to explore, I don’t think it’s going to happen. It’s pretty obvious she and Kylo will team up eventually. But with her tempted by the dark and him tempted by the light, I’m confident they’re both going to forge their own path together to become Grey Jedi and bring balance to the force, rather than one of them defecting to the other side. And I can’t wait. That ice fox is the most beautiful creature I've seen in a Star Wars film. It's hard to really formulate any coherent thoughts about this trailer that don't contain screaming or keysmashes. But I'll do my best. This movie... I'm not prepared. What happened to Kylo Ren's face? It looks robotic, but then it doesn't, and I have questions. Where are my boys? (Poe and Finn.) I need more of my boys. Okay, so, we didn't get much Poe and Finn, but I guess what we did get was pretty dang epic? Poe's words, "We are the spark that will light the flame..." That's a mantra for the ages. And Finn with a lightsaber? I'm so here for it. However, let's talk about the real stars of this trailer: Luke and Rey. Luke is so done with everything, and honestly? I relate. In all seriousness, though, I'm so glad we get to see more of him in this movie, and it certainly appears he has more lines. However, I just hope they keep his character true to the original Luke we all love. Judging from the trailer (which may or may not reflect the actual film), I have some concerns about where they're taking his character. And Rey? She's incredible in every sense of the word. I'm so glad we get to have her at the helm of the Star Wars films. I love her, I would give everything for her. 10/10. Despite my irritation with the will-Leia-die-or-won't-she aspect, seeing Carrie Fisher was a breath of fresh air. I honestly can't wait to see her, even if it will break my heart. I'm super intrigued to find out who Luke is talking about with the "raw power" line. He's likely talking about Kylo Ren, but what if he surprises us all and he really means himself or his father or someone completely unexpected? Chewie's new buddy is adorable. That is all. Conclusion? I'm not ready for this movie. Truly, are any of us? I guess we'll find out, and may the force be with us. There is so much packed into this trailer. But first, we need to remember something: trailers tell you nothing and everything at the same time. The people who make the trailer can take any scene and splice it together. They can make it look however they want, how they want you to think. They can place voice-overs with scenes that don’t match, with characters that don’t match. They can make it look like two characters are speaking to one another when it’s actually different scenes. Look! Kylo Ren is brooding again and throwing temper tantrums. My favorite. Rey with a lightsaber. Rey with a lightsaber. Rey with a lightsaber. Is Luke going to… abandon Rey? Is Poe Dameron going to single-handedly take down the First Order? Because I am ready. I would like the ice fox thing please. Whatever it is. I want one. Luke is just not happy. Nope. What happened to our ray of sunshine child? Why is Finn wearing a First Order uniform? Why is Snoke force torturing (???) Rey? is rEY GOING TO ASK KYLO REN TO TRAIN HER???? FREAKING MOOF-MILKING NERF HERDER! WHAT THE JAKKU IS HAPPENING?! Upon further viewing and discussion with fellow Star Wars nerd herders who have nothing better to do than analyze the trailer, here’s what I’ve come up with. My favorite thing was the music. I’m so ready for another amazing soundtrack by John Williams. Of course, the trailer makers perfectly timed that music to give you all the feels, mainly because it begins with the same chords as every other teaser/trailer for The Last Jedi and The Force Awakens. I have chills already. But when the music starts going as Rey speaks, wowza… I just got hyped for this movie! We’ve got Finn running around in a First Order uniform, but why? Did he rejoin? Is he brainwashed? Is he undercover? We do know that Phasma is definitely coming after him, probably for revenge, so that’s going to be a fun subplot. I can’t wait to see how that fight scene goes! It looks like Kylo Ren is targeting Leia’s ship, but after discussing that with a friend, I can’t imagine they’d have him kill both of his parents. I think the ship he’s targeting is something else. (Again, different scenes spliced together with voice-overs mean nothing.) Kylo Ren is definitely talking to someone in his voice-over, but who? Maybe it’s Luke or Rey. I have a feeling Kylo Ren is aiming to cut ties with everybody, including Snoke. Maybe he and Rey will team up against Snoke by the end of the movie. Also, I heard a while ago that they didn’t change the script of Episode VIII due to Carrie Fisher’s death. They said they weren’t just going to “kill her off” in the film. Of course, they could be lying. Because this whole trailer is probably a lie. I think they might just have something happen “in between” Episode VIII and IX to explain her absence. (Either way, this movie is going to be rough.) I’ve actually heard more people speculate that Luke will be the one to die, not Leia. I don't like it. It was hard enough to watch Han Solo die in Episode VII. I can't lose anybody else from the Original Trilogy. Overall, this trailer didn’t give us any answers. It only raised more questions and left us to pick up scattered pieces and speculate about what is happening. Maybe some theories out there will come true, but honestly, I don’t think we’ll know the whole story until we watch this film in December and Episode IX in two years. The point of trailers is to get people excited for a film, and I think they did their job well. They got everybody buzzing about it. Whether people are just glad to see Rey holding a lightsaber, to hear Luke talk, or to see the confirmation that Kylo Ren is a main character of this trilogy, the trailer received a reaction from the fans. Which is the whole point. What did you think of the trailer? React with us in the comments!